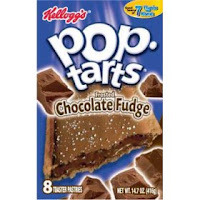 This one package of POP-tarts started a flood of old memories all of them revolving around Chocolate Fudge POP-tarts. In 9th grade Stefanie Peterson ask Jenn and I if we wanted to work at the church nursery on Sunday mornings and some evenings during the week. Her sister worked there as an Assistant Supervisor and they needed help. One of the directors was Jenn’s neighbor so we had a good in. We started working in the nursery at Village Baptist Church every Sunday morning, evening and week nights here and there. Sunday mornings though that is where the Chocolate Fudge POP-tarts came in. I don’t know who started it, Stef, Jenn, Heather, Tammi or my self but we started eating Chocolate Fudge POP-tarts almost every Sunday morning. These mornings brought me so much and so much joy. I am so thankful for those Sunday mornings and Chocolate Fudge POP-tarts. Hello!!!!! You can't forget about the chocolate POP-tarts and Dr. Pepper after math class on our way to science. Oh the good ol' days!